Ann Dawkins Lambert passed away peacefully Saturday January 6, 2018 at Brighton Gardens in Raleigh after a fifteen year battle with Alzheimer's disease. She was born April 9, 1936 in Lee County, NC. She was the daughter of the late John Everette Dawkins and Betty Marks Dawkins. Ann graduated from Deep River High School and graduated from Hardbarger Business College. She later attended East Carolina University. She had a long career serving the state of North Carolina in various roles. She began her career with the state in the Revenue Department in 1956. In 1959 she went to work in the Governor's office where she worked for Governors Luther Hodges, Terry Sanford and Dan Moore. In 1969, she became a stay at home mom when her son was born. She returned to work serving several senators and representatives in the legislator from 1975 to 1992. She then worked at the Attorney General's office from where she retired. Ann's Christian faith was very important to her. She was an active member of First Presbyterian Church in Raleigh where she served as a deacon and was a member of the Tom Albright Sunday School Class. She understood the importance of a close relationship with Jesus and helped instill that in her son. Ann married her husband George in 1960 and they shared 40 wonderful years together. Their happiest times were spent at their vacation home at Lake Gaston, cheering on the Wolfpack, parenting to their son and just being together. Ann epitomized the charm, grace and class of a southern lady. She treated all with respect and kindness. She loved the symphony, history, politics, spending time with her family and was an avid reader. She believed in doing the right thing and in doing things the right way. She preached and practiced the importance of a good attitude and was a positive influence in most all lives in which she came into contact. Ann was predeceased in death by her husband George in 2001. 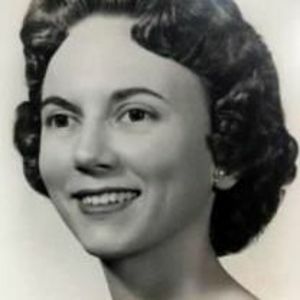 She is survived by her one son, George S. Lambert, Jr. and wife Jennifer; two grandchildren Rachel and Smith; one sister Gerri Dawkins Hearn and husband J.E. Hearn; many cousins and several nieces and nephews. Our family would like to express our heartfelt appreciation for the kindness and dedication of the many caregivers of Brighton Gardens who have attended to Ann over the last ten years. We admire them all for the challenging work they do every day. A visitation will be held Thursday, January 11, 2018 from 6:00 pm - 8:00 pm at Brown-Wynne Funeral Home, 300 Saint Mary's Street Raleigh. The funeral service will be held Friday, January 12, 2018 at 11:00 am at Hayes Barton Baptist Church, 1800 Glenwood Ave. Raleigh. A graveside service will follow at 2:00 pm at Zion Christian Church at 23 Zion Church Road in Sanford, NC. In lieu of flowers, memorial contributions may be made in Ann's memory to First Presbyterian Church of Raleigh, or Hayes Barton Baptist Church, or to Transitions LifeCare, 250 Hospice Circle, Raleigh, NC 27607.